Swans usually mate for life so are the perfect bird to feature in this romantic Valentine's design. Surrounded by love hearts and fiery Lily and Rose motifs, fall in love with stitching this romantic mini cushion. 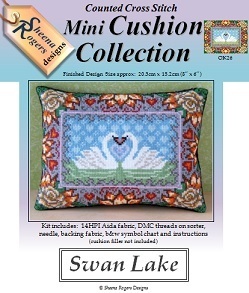 This Swan Lake Mini Cushion Cross Stitch Kit includes: 14HPI white aida fabric, ready-sorted DMC threads on card sorter, needle, black velvet backing fabric, black & white symbol chart and instructions (cushion filler not included).